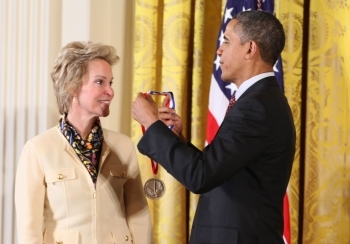 Deputy Secretary Rebecca Blank joined President Barack Obama Friday, February 1 at a White House ceremony honoring the recipients of the 2011 National Medals of Science and National Medals of Technology and Innovation. These medals are presented each year by the President of the United States. The Department of Commerce’s United States Patent and Trademark Office (USPTO) administers the National Medal of Technology and Innovation honoring those that deliver technologies that are changing society and improving the quality of life. The National Medal of Technology and Innovation is this country’s highest award for technological achievement. The medal is awarded annually to individuals, teams, companies or divisions of companies for their outstanding contributions to America’s economic, environmental and social well-being. By highlighting the national importance of technological innovation, the medal also seeks to inspire future generations of Americans to prepare for, and pursue technical careers to keep America at the forefront of global technology and economic leadership.